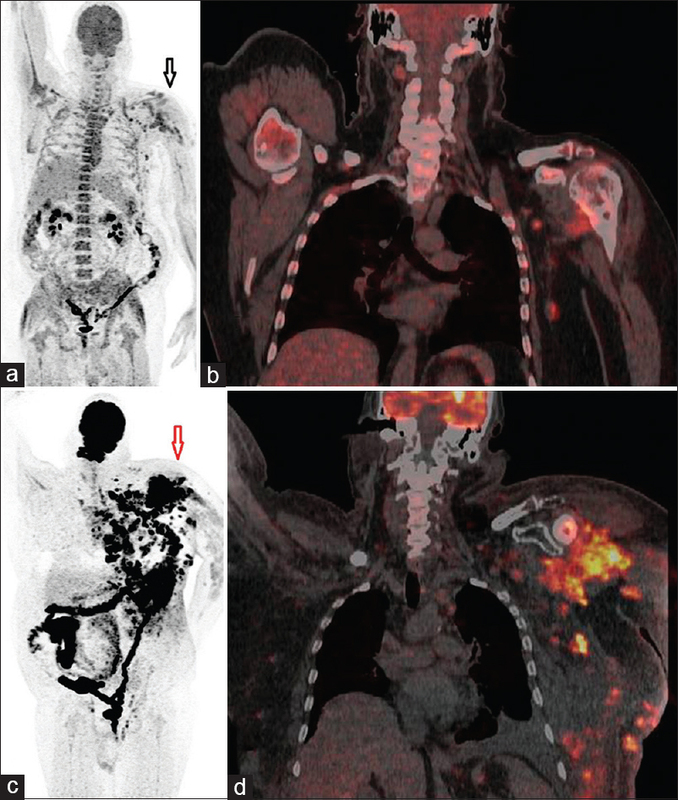 A 58-year-old male, known case of plasmablastic lymphoma, presented to our department for 18 F-fluorodeoxyglucose positron emission tomography/computed tomography (18 F-FDG PET/CT) for response evaluation post five cycles of chemotherapy. Despite multiple efforts, an intravenous access could not be established because of anasarca. 15 mCi of 18 F-FDG was diluted in 10-ml water in a disposable plastic cup, and the patient was administered the dose orally. Subsequently, the PET scan was acquired after 90 min, which showed normal physiologic distribution in the brain, kidneys, and urinary bladder along with activity visualized in the mouth and large bowel as well. Pathological uptake was noted and was compared with the previous scans [Figure 1]a and [Figure 1]b. All the previously FDG-avid sites were seen in the present scan also along with new lesions with FDG uptake, indicating progressive disease [Figure 1]c and [Figure 1]d.
We reviewed literature and found a study done by Nair et al., on two healthy volunteers and 7 patients, who underwent PET/CT after oral as well as intravenous routes of 18 F-FDG administration. They concluded that oral 18 F-FDG scan can successfully be substituted for intravenous 18 F-FDG scan. A case has also been described by Franc et al., in which a solitary pulmonary nodule was evaluated by PET/CT after oral administration of 18 F-FDG because the patient had poor intravenous access. Although the oral route is acceptable in assessing the lesions involving the head and neck, thorax, and peripheral sites (appendicular skeleton), it would be inappropriate to evaluate diseases of gastrointestinal (GI) tract, as majority of the administered dose persists in the GI tract. As the amount of dose absorbed through the GI tract cannot be predicted, quantitation would be unreliable and the scan needs to be acquired as late as possible as absorption from oral route would be erratic (preferable after at least 90 min). We therefore conclude that oral administration of 18 F-FDG is an acceptable alternative route for PET studies in patients with difficulty in establishing intravenous access with a word of caution as stated above. Nair N, Agrawal A, Jaiswar R. Substitution of oral (18)F-FDG for intravenous (18)F-FDG in PET scanning. J Nucl Med Technol 2007;35:100-4. Franc B, Carlisle MR, Segall G. Oral administration of F-18 FDG to evaluate a single pulmonary nodule by positron emission tomography in a patient with poor intravenous access. Clin Nucl Med 2003;28:541-4.